A CO2 pistol from Valken Tactical that is affordable enough to appease the budget-conscious... "The Valken Tactical M84 is a metal Co2 powered NBB "non blow back" 6mm Airsoft pistol ideal for target practice, backyard plinking, or as an affordable back up side arm for airsoft games . The 12 gram Co2 is contained in the grip and is separate from the stick type BB magazine that allows you to fire several stick magazines without the need to replace the Co2 powerlet often, making it not only affordable but efficient. 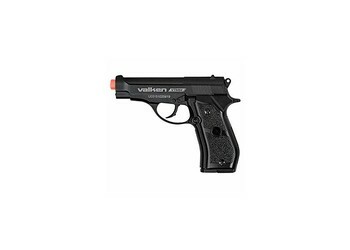 We recommend always using Valken Tactical Airsoft BB's and 12 gram Co2 cartridges for optimum performance. Magazine: 20 Round 'Stick Type' Magazine"